What is the difference between a public school and a charter school? So who are charter schools accountable to? Do charter school students have to pay tuition to attend the school? Is my child eligible to come to a charter school? Who can apply to Alliance For Progress Charter School? When must I apply to Alliance? What happens after I've been selected? Does Alliance provide bus transportation? If my child already attends AFPCS, do their siblings also have to apply through the lottery? Charter schools are public schools run by independent entities. The founding premise behind charter schools was to give communities the opportunity to educate their children according to their own philosophies of education. The "charter" or agreement establishing each such school is a performance contract detailing the school's mission, program, goals, students served, methods of assessment, and ways to measure success. Each charter school has an agreement with its school district outlining exactly what its plans are and how they plan to implement them. Accordingly, charter schools may hire their own staff, develop their own curriculum and set their own educational programs and methods of operation under the oversight of the school board and authorizer/sponsor. In addition to adhering to all of the same state and local rules and regulations that public schools must adhere to, charter schools have an added level of accountability. They are overseen by their charter authorizer (for us it is the School District of Philadelphia), and if a charter school does not meet specific standards as determined by the state and its authorizer, the school's charter may not be renewed which would result in it being shut down. Charter Schools are also held accountable by their school board, who has ultimate responsibility for meeting the requirements of the charter. Finally, charter schools are held accountable by their parents and students who are there by choice and can ultimately choose another school if they aren't satisfied. Charter schools receive funds on a per-student basis from the state in which they operate, just like traditional public schools do. Charters, just like traditional public schools, do not charge tuition. Charter schools must admit any student according to their stipulations who applies unless the classroom capacity is exceeded, in which case a public lottery is held to randomly fill the available seats. 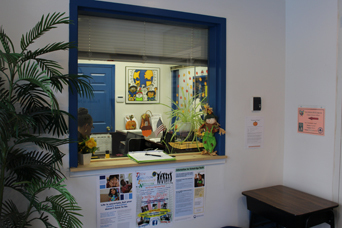 Admission to the school is open to all eligible students who are residents within the limits of the City of Philadelphia and the state of Pennsylvania in grades K through 8. AFPCS does not discriminate on the basis of race, color, nationality, creed, gender, ethnicity, mental or physical disability, proficiency in English, or prior academic achievement when recruiting or admitting students. Kindergarten: Children applying for Kindergarten must be five years of age by September 1st of the current year in order to be accepted into the school. If the child is not five by the deadline, their name will be placed on the waiting list for possible admission for the following school year. First Grade: Children applying for First Grade must be six years of age by September 1st of the current year in order to be accepted into the school. If the child is not six by the deadline, their name will be placed on the waiting list for possible admission for the following school year. Enrollment is open from October 5, 2015 through March 18, 2016 for the 2016-2017 school year. You must apply using the downloadable form within that time. A public lottery is conducted each year after the close of the enrollment period (Lottery date: April 15, 2016). At that time all students will be placed on a waiting list. As openings are available, you will be contacted via phone and email in number order according to the waiting list. Remaining applications will remain on the waiting list according to grade and will also be notified via phone and email as openings become available. In the event an opening occurs in any grade until February 1 of that school year, a student on the waiting list of that grade will be contacted by telephone and email. Once you have been notified of your child's acceptance, you will need to contact us to confirm your enrollment and to receive the enrollment packet. You will then need to complete enrollment data forms and submit all of the paperwork necessary by the deadline. Once everything is completed, you will receive confirmation and an invitation to attend our "New Family Orientation." AFPCS does provide bus transportation provided by the School District of Philadelphia for students in grades 1-6. To be eligible, the student must reside at least 1.5 miles away from the school and live within the city of Philadelphia. Students in grades 7 & 8 may be eligible for tranpasses for SEPTA. Families are important to us. We believe that having siblings attend the same school enriches their individual education experiences. We also recognize that it is convenient for parents/guardians to have their children at one school. For this reason, we give siblings preference in the enrollment process. A sibling is defined as a biological or legally adopted brother or sister living at the same address. Cousins, nieces, nephews and unrelated children sharing an address with the applicant are not considered siblings. To enter a sibling on the waiting list, you must fill out the Sibling Interest Form that is distributed in February to current students.